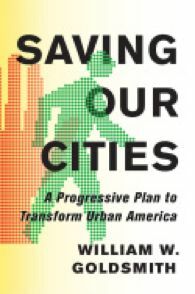 Author William Goldsmith will be at the UNM Bookstore on Friday, Sept. 16 at 2 p.m. to sign copies of Saving Our Cities (Cornell University Press, 2016). This event is open to the public. metropolitian areas will thrive, thus making the national economy more productive, the environment better protected, and citizenry better educated. Goldsmith argues that America has been in the habit of abusing its cities and their poorest suburbs, which are always the first to be blamed for society’s ills and the last to be helped. Goldsmith attests that when more cities forcefully demand enlightened federal and state action on four interrelated problems: inquality, schools, food, and the drug war, positive movement will occur in traditional urban planning as well. William Goldsmith is professor emeritus in the Department of City and Regional Planning at Cornell University. He is coauthor of Separate Societies: Poverty and Inequality in U.S. Cities. The UNM Bookstore is located at 2301 Central Ave. NE at the intersection of Cornell and Central. Please contact Marie Claire Day at 277-1388 or mclaired@unm.edu for more information.